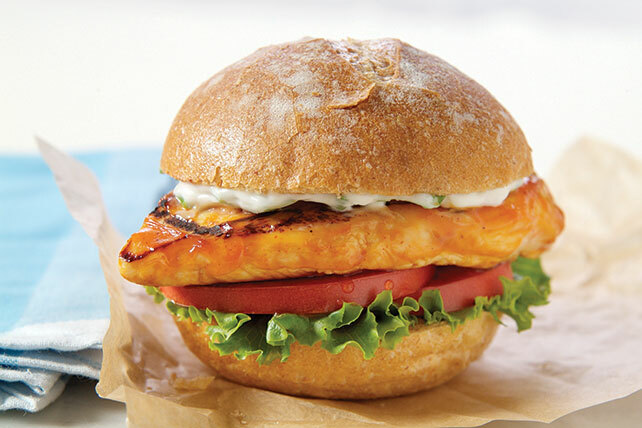 Reinvent the popular bar snack as a sandwich with our Grilled Buffalo Chicken Sandwich. Your entire family will love this Buffalo chicken sandwich recipe. Preheat grill to medium-high heat. Mix mayo and onions; cover. Refrigerate until ready to serve. Brush chicken with oil. Grill chicken 4 min. on each side. Brush lightly with barbecue sauce. Continue grilling 2 min. or until chicken is cooked through (170°F), turning and brushing occasionally with the remaining barbecue sauce. Spread top halves of rolls with the mayo mixture. Place lettuce and tomato slices on bottom halves of rolls; cover with the chicken and tops of rolls. Substitute BREAKSTONE'S or KNUDSEN Sour Cream for the mayo. Stir 1/4 cup ATHENOS Crumbled Blue Cheese into the mayo mixture before using as directed.